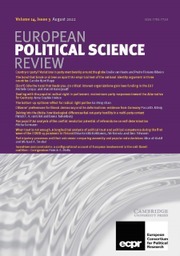 The European Political Science Review (EPSR) publishes high quality scholarly research in political science, focusing on the most important debates in the discipline and demonstrating the highest possible standards in conceptualisation, theorisation and methodology. Submissions should emphasise why they are of interest to a broad readership across sub-disciplines and should engage with central theoretical debates in political science. EPSR welcomes empirical papers based on either qualitative or quantitative methodologies. These papers should be placed in the context of larger (theoretical) debates in the discipline. EPSR also welcomes conceptual and theoretical papers as well as contributions from the field of normative political theory. EPSR is not concerned solely with European political issues nor is it conceived as exclusively for European scholars. Submissions dealing with global issues and non-European topics are very much welcome.